A recent study in JAMA March 2010 issue suggests that the use of eGFR is making people question the results and send more referrals to Nephrology by 70%. The study was a community based cohort study with time series analysis and from 2003-2007. 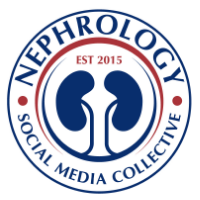 They found that the first visit nephrology consults were increased significantly among patients with severe kidney disease, middle aged women and the very elderly, and severe comorbidities. No outcome measures were done. This raises a few concerns and questions. A nice editorial in the same issue of JAMA, was even more fun to read. Does one reading of eGFR enough? Do we classify people in one ready or one calculation at one period in time. GFR separated by 3 months might be better, 2 months or 1 month? Based on KQIGO, direct measurements of estimated GFR seprated by more than or equal to 3 months would be preferred. The editorial points out that these studies don't define outcome. Calling someone CKD with GFR less than 60 has been challenged before and especially in extremes of ages as there is a natural decline in GFR as we age. What the editorial nicely stresses is perhaps in the older age population, a GFR less than 45cc.min/1.73m2 is a better cut off. This might not hold true for someone with proteinuria, hematuria or strong family history of kidney disease. What the problem is the measurements of GFR - we don't have a good method yet? Neither of the GFR calculators are perfect, nor is the basis of it- Creatinine. but that's the best marker we have. Till we find a troponin for the kidney, we are going to run into this problem for a while.